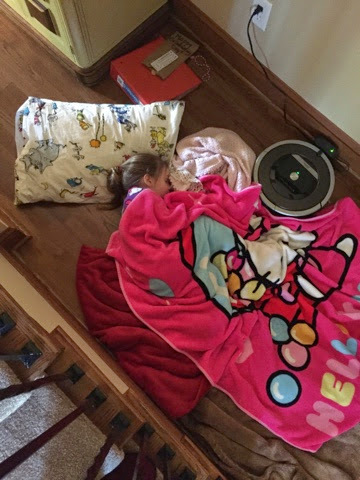 Okay that title was a hair misleading but we've got the sickies around here and when Papa's sick/tired and otherwise occupying the nap location we resort to hallways next to the parked Roomba. E said she liked her 'Rest Nest'. Rhyming and fun names make things way more fun. I mean relegated to the cold hardwood floors with 3 blankets or Rest Nest? Now I need to come up with a catching name for: I'm sleeping on the couch tonight because I don't want to get what the others have. I might drag R out here with me because somehow she has evaded the 18 hr stomach bug for some reason. M got sick on the way home from church Sunday; rather 1.5 minutes into the 55 minute journey so with a single wipe left we stopped at a gas station for some wipes but poor kids, the van stunk. Fortunately I had 2 extra outfits for her but only needed one (thankfully). Everyone else seemed totally fine so we chalked it up to her eating some baby cream the night before and then dairy overload for breakfast. Milk + yogurt. This past Monday E made some sort of portico thing with table and chairs out of real Legos - the bitty ones. I convinced her to let me carry it in because it was windy and raining and M was still not 100% so I threw her in the Beco and for some INSANE reason I gave her the masterpiece just as we were turning the corner to the hallway for her class and the poorly reinforced overhang/top part started to crumble. So I'm sitting there with her trying to get those tiny pieces back together so we don't meltdown.... and she didn't! It was shocking. But seriously. Legos for show and tell? I don't like to veto show and tell items but I would consider it. M and I hung out for the morning. She let me do some work. She was insanely cute trying to carry stuff and walk. We packed up early and headed for the warehouse to give them the paperwork for a truck that was coming in a few hours (crucial info). Retrieve big girls from school. Papa is reminded of the joys of lunchtime fun. Everyone needing something JUST as you sit down. Someone wanting this and another committing to BBQ but then loses it when she realizes its not BBQ chicken wings. I think I've been on the phone all day for work (but I really haven't). Phone rings... Warehouse says the truck cannot get into the warehouse so it is literally parked in the middle of the road waiting for us to figure out how to load 20 pallets in it. Good thing Papa's on afternoon kid duty because I have an eye appointment and a pallet jack (my proposed solution to the truck entry issue) crisis. Assess warehouse situation. Thank goodness the equipment rental store is a quarter mile from the warehouse. I walk down there and rent a pallet jack and drag it back to the warehouse (halfway because my truck loading partner in crime meets me in the middle). Pallet jack is too thick for my pallets. I knew I picked the wrong one! Walk back to the rental place. Hope they don't double charge me. Get the other jack but we'll have the same issue. Partner in crime has brilliant idea to stack on other pallets to avoid the jack width problem. Driver only wants to take 19 pallets. But I want 20. But 19... Okay 19. Leave warehouse 3 min before my eye appt which I had already called to tell them to move my appt back 30 minutes because well... see above. Quietest moment of the day was getting bright lights blasted into my eye balls. Get another 6 month supply of contacts in the hopes I'll be back in 6 months instead of 2.5 yrs. Leave feeling like I had earned my keep for the day. Get home. All is calm. All is nigh. Dinner. Showers for the bigs. Reading, praying etc etc. 7:45 get into bed because I want to. Lee gives me a hard time. I fell asleep during the Superbowl the night before but it was 24-14 and the Pats weren't doing ANYTHING! Okay probably shouldn't have fallen asleep. 8:00 - JUST as I was about to fall asleep. You know the feeling. Crying ensues and we discover that E was for real about the tummy hurting issue. For the next 2.5 hours I run to the bathroom with E whenever I hear her sprint down the hallway. She WON'T go to sleep without her Nini which was a victim of the missed bathroom run. And that was all yesterday! Somehow by the Grace of God I made it through today which involved Lee declaring his state of unwellness around 8 am. The girls and I colored (twice), read books for a while (twice), watched PBS (thrice). I gave up on trying to isolate E or R (I'm assuming M is through with it). They share a room so if R is going to get it - it will be a bummer. E perked up about 18 hours after last night so I am hopeful Papa will rebound similarly. I am so grateful/thankful this does not appear to be a week long stomach bug/flu. I was thinking about how grateful I am to have healthy kids and husband with treatable illnesses. I am thankful for the little moments with my girls. or chasing after M while she's riding her buggy. I am grateful for a job that let's me work from home and take time for my family especially when they need it.